In advanced maps, we added 15 predefined maps styles (including the default). 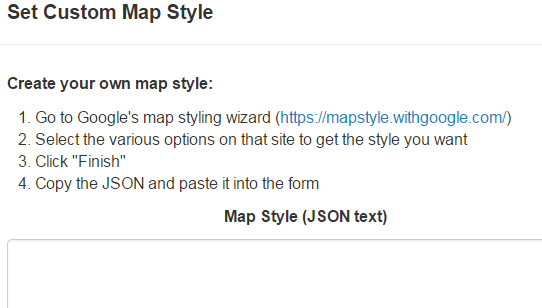 In addition, you can create your own style using Google’s styling wizard (https://mapstyle.withgoogle.com/ ) or you can use a style found somewhere else. 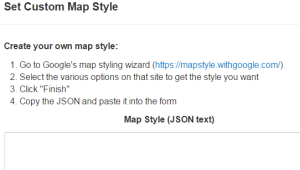 To create your own style select the custom style and paste the JSON data obtained from Google’s styling wizard or another site of your choice. Easily zoom in to a marker with the new zoom icon. This should be present when an address is displayed. The paging buttons have been moved down towards the bottom of the page for maps viewed on a PC. P.S. As Always, Get Mapping! Another great feature was added to EasyMapMaker due to quite a few requests. We added the option on advanced maps to add a circle around all your markers. You can either use one of our predefined values or set your own in based on your data. This feature can be combined with pin labels to label the marker (and circle). During editing the circle will move if you move the marker. For a sample look at : Map with circles around the pins. More improvements were made to EasyMapMaker.com. You can now drag and drop your excel file into the form or use the traditional copy/paste method. Another great change is the ability to edit and resave the map from both the map create and map edit page. The map is now wider as well. 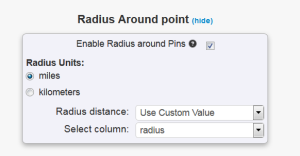 This should make EasyMapMaker the best place for creating custom google maps from your address data! The latitude and longitude coordinates are now longer displayed in the table. We wanted to make sure we were in compliance with google’s terms. We added a coupe new features. One feature is the ability to export the data on your map directly to excel. This is automatically added if you have data exporting enabled. Another feature is to use google maps directions. There is a ‘Google Maps Directions’ option for this. It should open up either the google maps app or a page in a new browsers. As always, keep on mapping! After numerous requests to make maps more secure other than having a random url, we have added the ability to protect maps with passwords over our secure site: https://www.easymapmaker.com. The secure site no long has the option for public or private maps. Maps will default to private. If you add a password then that is an extra layer of security besides the url. It also forces the use of our secure site to view or edit the map when there is a password. Only our English site has map passwords for now. If you forget your password, you can either change it with the browser (and computer) you used to create the map or through a link sent via email. There is now the ability to force the language in advanced maps. It will default to google’s default, which probably right in most cases. There is also error handling for the edit page to make it very clear when column headers have been added or removed and should not have been. This will break the map. EasyMapMaker.com está ahora en español: http://www.easymapmaker.com/es. Como siempre, obtener la cartografía!